Phnom Penh is a very crowded city. It is comprised of people who come from every Province and village in Cambodia. There are 897 villages within the city limits. (Country-wide there are more than 14,000 villages.) Current government statistics state that there are approximately 1.5 million people living here in the city. 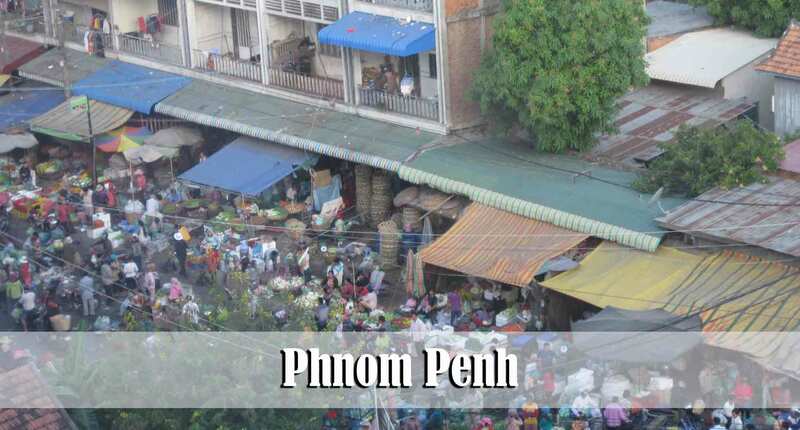 The metropolitan area of Phnom Penh is home to about 2.2 million people. Our primary outreach is directed toward the people who live here in the city, specifically the people who live in and around our locality. We believe that as strong churches are planted here in the city, the entire country can be reached with the Gospel. As we have stated in past posts, we are strategically reaching out from Phnom Penh to other areas that are within two hours of our church. We are presently reaching out to about 10 different villages. 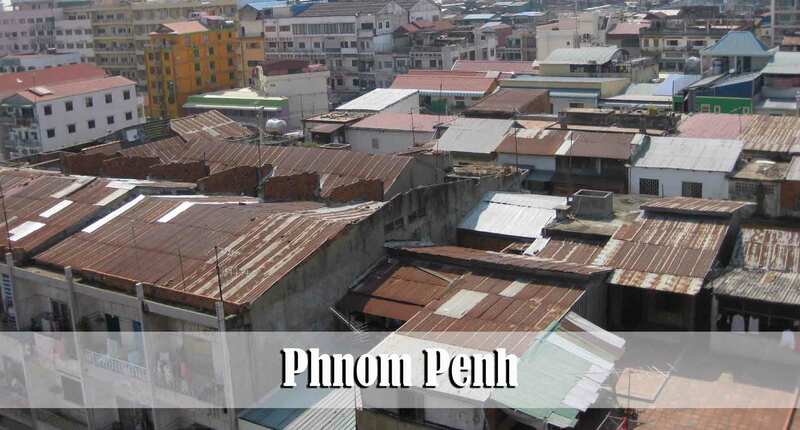 This is possible only as the folks here in Phnom Penh begin to have a burden for lost family members who still live back in their respective villages. 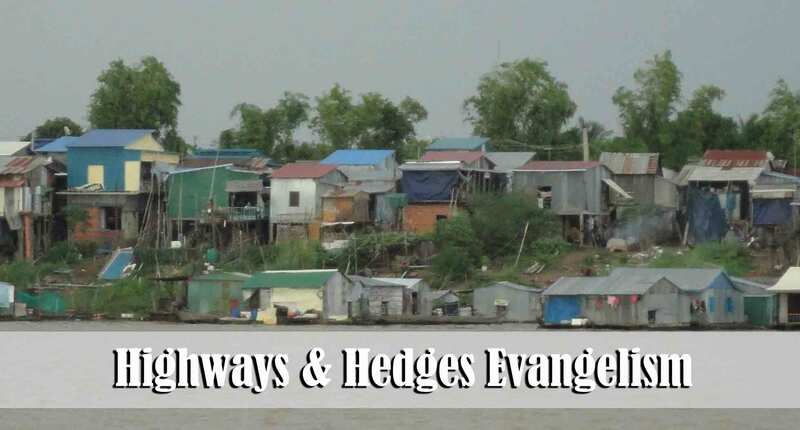 We recently began a new ministry called Highways & Hedges. The goal of this ministry is to distribute gospel tracts door-to-door in remote villages where there are not currently any type of gospel preaching churches. This last week was our “kick-off” for this ministry and we encouraged many folks to get involved. I had publicly stated that our goal was to have 40 folks involved on our first day. We were all very pleased last Saturday to have 61 folks show up eager to get involved in this new ministry. In three hours we were able to pass out nearly 2,500 tracts along National Highway 5. 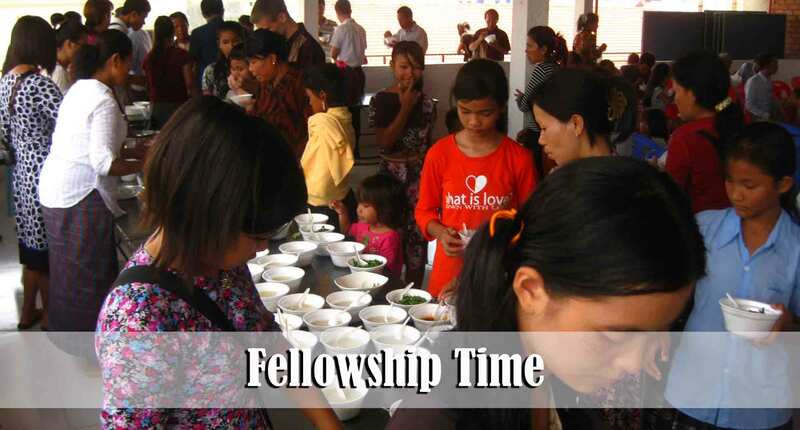 (In Phnom Penh 61 people could, no doubt, hand out 2,500 tracts in less than 30 minutes.) We do not do mass tract distribution in Phnom Penh. As a rule, that would not be a very effective means to present the gospel and see people saved here in a Buddhist culture. However, in remote areas where people are not accustomed to having strangers hand out literature we have been encouraged to see that they are willing to read the tracts. Our primary goal in the Highways & Hedges outreach is to, at a minimum, plant the seed of the gospel into the hands of people in these remote areas. Yesterday I was able to return to one of the villages that we had visited last week and begin teaching a group of about 6 people who have showed an interest in knowing God. Please pray for these teaching times in the village named Poom Grewa. I’m presently teaching and explaining the gospel to two grandmothers and 4-5 young people. Poom Grewa is about 2 miles past Prak Pnou village. Highways & Hedges will meet and go out one Saturday a month. We were blessed to have 15 of the teens involved in Highways & Hedges. This year we are on purpose trying to do some things to help ground the teens in their faith. An important part of their spiritual growth includes being a public witness for the Lord. We were all encouraged to see their excitement and boldness as they went door-to-door. On our way back to Phnom Penh we enjoyed a time of fellowship. 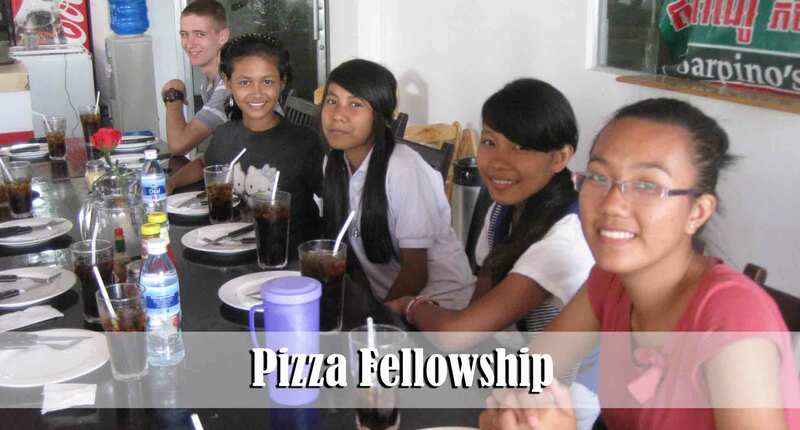 For several of these young people this was the first time they had ever eaten pizza. 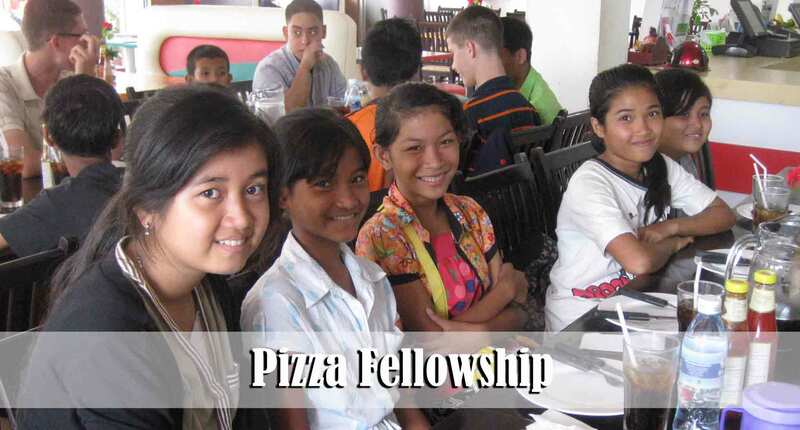 Teens are the same everywhere – they love pizza ! It is important to evaluate each ministry in the church. Ministries that are not producing lasting fruit should be changed or eliminated. This month we are evaluating every ministry of the church. Some programs will be eliminated. Others will be given more attention and effort. One of the areas that we are hoping to strengthen is the outreach to our faithful teens. (The focus will not be on the casual attender but rather on the teen who is already faithfully attending church.) With the Lord’s help, we hope to do some things with the teens that will help encourage a higher level of commitment to the Lord as well as a higher level of involvement in ministry. Please pray for the teens of Pacific Baptist Church of Phnom Penh to be excited to embrace the vision and be willing to step out of their comfort zone for the Lord and the good of the church. 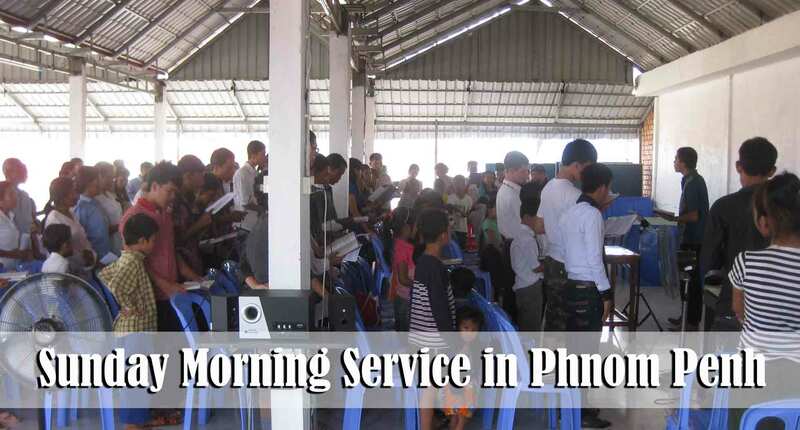 We had great services today in Phnom Penh. I continued with the series dealing with the transformed life from Romans chapter 12. Today we considered verse 13, “Distributing to the necessity of saints; given to hospitality.” Next week we will actually deal with how a believer is to go about helping another believer in times of need. But this morning we explored some of the causes of poverty. There are many factors that contribute to poverty. Some poverty is the result of outside influences such as war, corruption, and natural disasters. However, this morning we focused on poverty that can come as a result of one’s personal sin or sins committed within their family. I devoted some time to each of the following sins and how, according to God’s Word, they contribute to poverty: 1) Laziness, 2) Gambling or the desire to get rich quick, 3) Stinginess and Covetousness, 4) Immorality, 5) Alcohol and Gluttony, 6) Deriving one’s income in an immoral way, 7) Not being faithful to the Lord by the paying of tithes and giving of offerings, and 8) Turning a blind eye to others in their time of need. It was actually a a bit difficult to preach this message. Many people in this country have been conditioned to be a “receiver” rather than a “giver.” It is a mindset that is not a Biblical one. It may have been shocking for some to hear this morning that not all the poverty in Cambodia is as a result of war in the past or present day corruption by some who are in power. I’m thankful to have the privilege to preach to and teach new believers who, although a truth may be hard to receive, are willing to listen to truth being taught and act upon that truth. This morning we all enjoyed a time of fellowship after the services. It was a great opportunity to spend time getting to know some folks with whom we don’t normally have time to fellowship. We thank the Lord for the building that He has provided that will facilitate such fellowships. This morning we had 24 folks follow the Lord in believer’s baptism. We were all very encouraged to see them take this public stand for the Lord. There is much confusion in this country regarding baptism. It has been our experience that the vast majority of “churches” here in Cambodia believe in baptismal regeneration. For some groups baptism provides a perfect opportunity to win the affection and financial assistance of visiting foreigners. Today one of our teen girls told me that this was the second time she had been baptized. She said that before she was saved a “church” hired a man to go to her village and recruit a bunch of children to go to the church and get baptized. She said that was his full-time job – going from village to village and gathering many people to come to the city and get baptized. No doubt the pictures and reports were sent abroad for the benefit of well-meaning donors. Sad to say, that is not an isolated incident. Grandma Sooan was baptized this morning. Please continue to pray for her husband, Chang, to be saved. Sooan is a growing believer and was very excited to be able to publicly follow the Lord in believer’s baptism. 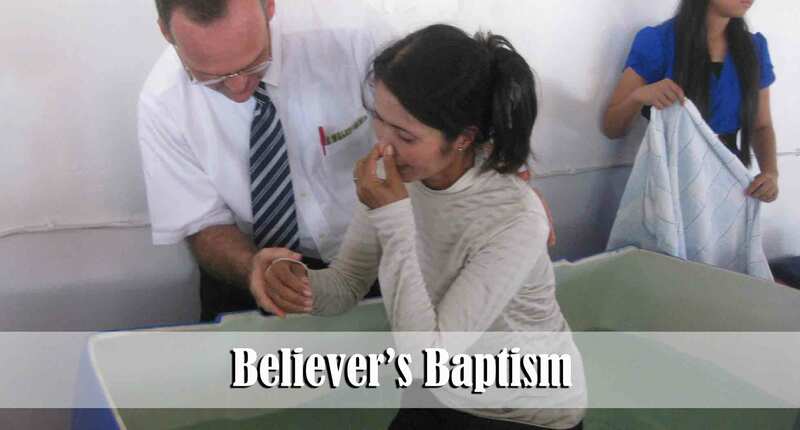 Mr. Somvoeuth also followed the Lord in believer’s baptism. He, like Brother Sinath on the left hand side of this photo, is a tailor. His business is located on a very busy street in Prak Pnou village. As a small business person he is concerned with how he is perceived by the community; if they think that he has “betrayed” the national religion of Buddhism he is fearful that they will stop coming to his business. This fear caused him to keep his Buddhist altars in his home and business even though he professed to place his faith in Christ and stopped offering sacrifices to the ancestors and the devil. Thankfully two weeks ago he took the step of faith and destroyed the altars. 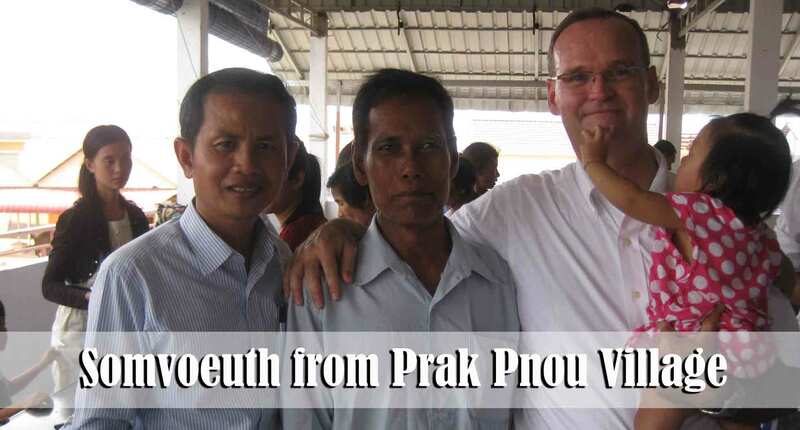 Please pray for Samvoeuth to continue to grow in the Lord. 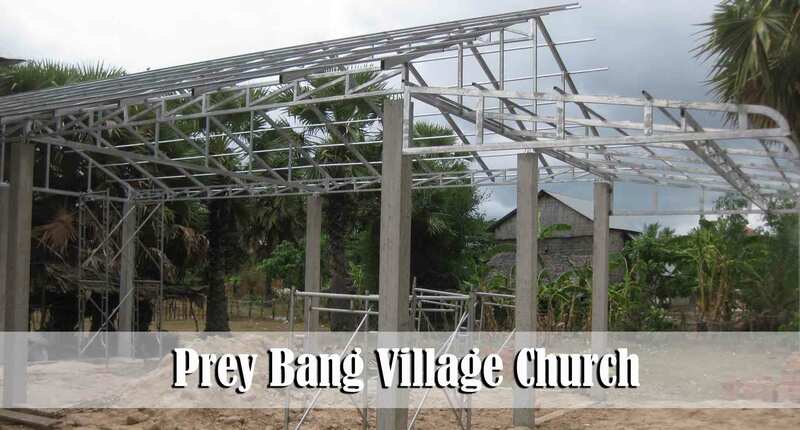 We are still patiently waiting for the roof to be completed on the Prey Bang village church. I give the contractor credit for coming up with some pretty creative excuses this week. Hopefully the roof will be completed by the end of this week. Soly and her husband, Tola, live about three houses from the church in Prey Bang village. We are happy to report that Soly accepted Christ as her Saviour two weeks ago and Tola accepted Christ this past week. Tola comes from a family that is deeply involved in the occult. For many years he has had an “angel” that appears to him and “helps” his family. We know that this angel is nothing more than a familiar spirit (an evil spirit that has been passed down within the family from generation to generation). The reason that he would not accept Christ at the same time as his wife is that he thought it was impossible for God to save him. The believers in the village give testimony that on Saturday night Tola and Soly destroyed all of their altars and occultic items in their home. This morning at church Soly confirmed that they both want to be fully committed followers of Christ. Soly requested that the spirit strings be cut off of her and her children, and so this morning after the service we did just that. 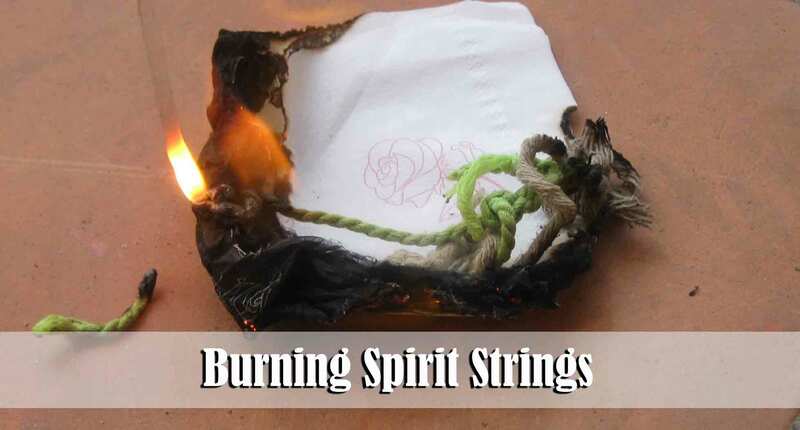 Spirit strings are used by witchdoctors for various reasons. Ultimately it is believed that they provide protection from the evil spirits. The news will spread quickly in the village that this family has taken a stand for the Lord. Already some of the neighbors have responded to the destroying of their altars by cutting up a Bible and strewing it all along the road that leads to the new church building in the picture above. Tola and Soly as well as some other folks there in the village are just new believers and they are not sure how to respond to the actions of these neighbors. This morning Brother Sinath and I were able to spend some time teaching them how we are to respond when non-believers persecute us because of our faith in Jesus Christ. Please pray for Tola and Soly’s safety as well as their spiritual growth. 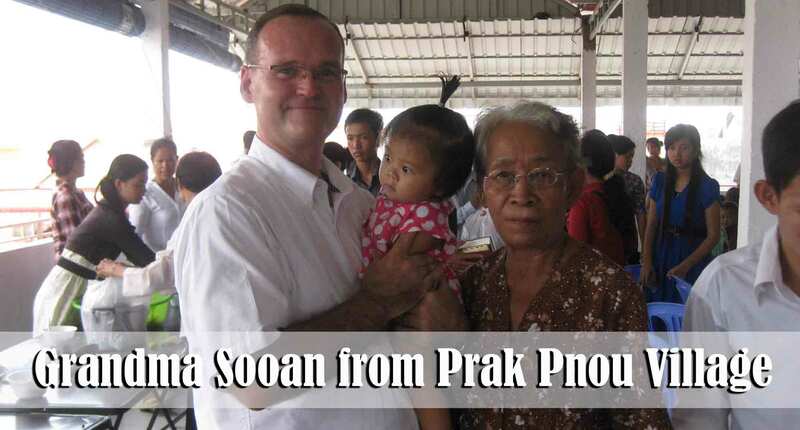 Please pray for Oeun and her adult daughter, Oal and their family. They live in Prey Bang village and have both professed faith in Christ within the past three months. It was a blessing last week to be able to teach them both. They are likely some of the poorest believers that we know. For the past 10 years they, and many other families, have been squatters on land that is owned by the local Buddhist association. This past week one of the monks came to her home (the shack behind them) and asked Oeun the following question: “I heard that you are now a Christian. Is that true?” Oeun responded that she had indeed trusted the Lord for salvation and is now a follower of Jesus Christ. She was then told by the monk that she and her family would soon be evicted off of the land because of her decision to follow Christ. This leaves this very poor family is a tight situation. If they remain resolved to follow Christ they will literally become homeless with, humanly speaking, no other options on the table. Oeun has stated that under no circumstances will she turn away from the Lord. Please pray for these dear folks as well as for all of us to have wisdom to know how best to help her. You may recall my writing about Brother Maldy and his family last year. They are the family who faithfully rode their bikes 26 miles round-trip to church several times a week. Several months ago they had some issues arise that prohibited them from coming to church. We were all so thrilled this morning when they showed up at church. Maldy told me that issue is now resolved and they will once again be faithfully involved in attending church. Pray for this family’s spiritual stability. They are very gracious and giving people even though they own almost no worldly possessions. Their example is a great challenge to us all ! I snapped this photo Friday afternoon as we were stuck in a traffic jam. 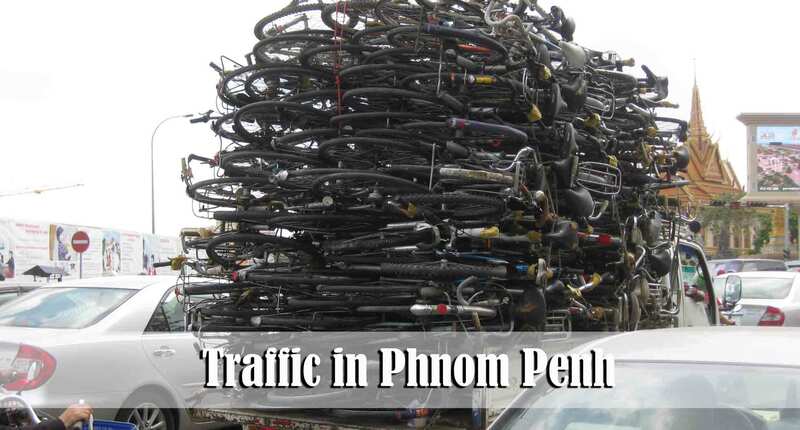 We have seen them stack bikes even higher than this ! We will be praying and asking the Lord Jesus to provide relief for these new believers in regard to their spiritual, shelter, and financial needs. Is there a way we can provide financial gifts to assist at least in providing meals? May God bless your efforts on behalf of his kingdom.